Sounds like a pretty easy lunch date: get some take-out pizza, pick up some friends, head over to another friend’s house to eat. In the US of A, it would involve jumping into the car, swinging by Domino’s and just, w ell, driving there. It’s a little more complicated in Mexico. 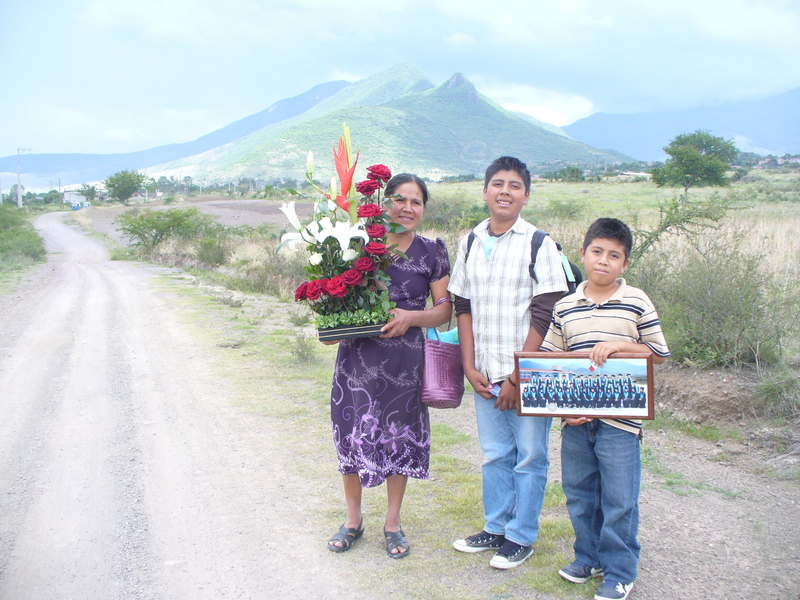 The occasion was to loosely celebrate the end of chemotherapy with Lupita along with her sons, who live in the village of Teotitlán del Valle about half an hour outside of Oaxaca City (when the traffic’s not bad and there are no bloqueos on the highway.) My friend Mary, who has been driving Lupita to her chemo treatments, would take me in her car, saving about an hour of bus-bus-colectivo-mototaxi travel. Somewhere in trying to find a day convenient for all of us (I text Lupita in Spanish on her cellphone; she may live in a village but she stays connected), Norma – who also lives in Teotitlán – said she’d like to join us and volunteered to have us over to her house to eat, if we’d pick up Lupita and the boys on the way in. So I would ride out with Mary, but since she lives on the eastern side of the city in another town halfway to Teotitlán, I agreed to meet her out where the highway turns, at the big Porfirio Diaz monument where buses and taxis turn off to several destinations. She’d bring the pizza, easier bought from Walmart and doctored up with a little extra mozzarella than actually picked up at a Domino’s (though there are several in town). 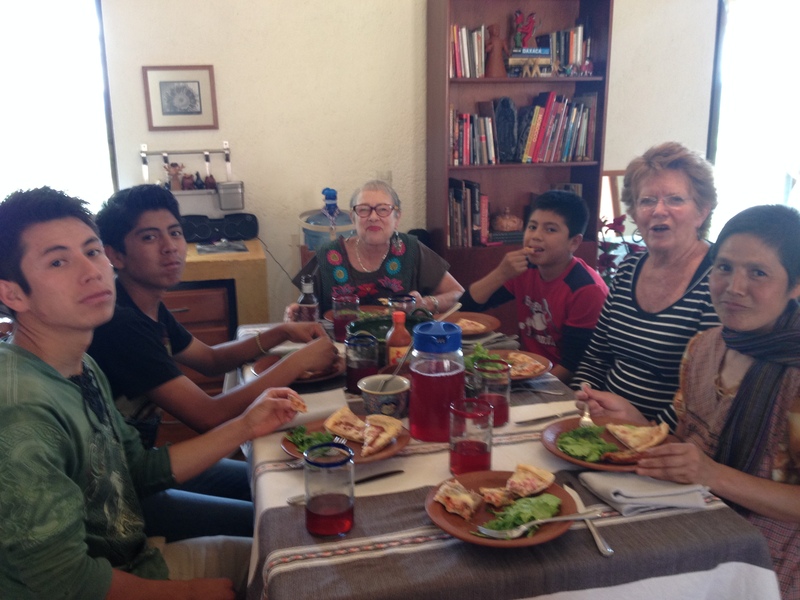 She’d already gone shopping and pre-baked the pizzas (six in all) so we wouldn’t be too delayed eating the afternoon meal with hungry teenage boys. I’d signed up to bring dessert, and had baked zucchini bread and made fresh fruit salad of pineapple, mangoes, bananas and grated coconut. Working on my Web-content writing gig right up until time to leave, I finally had to throw everything into two bags and hoof it to the main street to catch a taxi since I’d waited too long to make the double-transfer bus connection. I had a bag of goodies from the states – mostly the thrift stores – for Lupita: a set of sheets, cosmetic bag with Burt’s Bees chapstick and hand cream, a hanging bag with little zipper compartments to store things off the dirt floor at her house, and a pair of jeans since she’d gotten thinner with chemo and felt chilled in her usual dresses and bare legs. Then there was the bag with my rain jacket and umbrella (rainy season’s begun), visor, sunglasses, fruit salad and zucchini bread. Mary picked me up at the monument, about a third of the way to Teotitlan from the city; the drive through the valley with mountains flanking either side is one of my favorite. 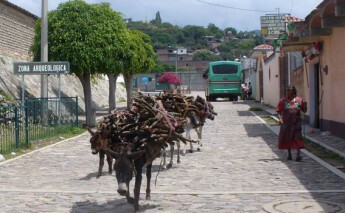 Though it’s only a town of about 5,000 people, Lupita lives up on the hill overlooking the church and Norma on the other side – it would be at least a 30 minute walk without the car, or a combination of mototaxis who actually don’t pass often on Lupita’s dirt street. 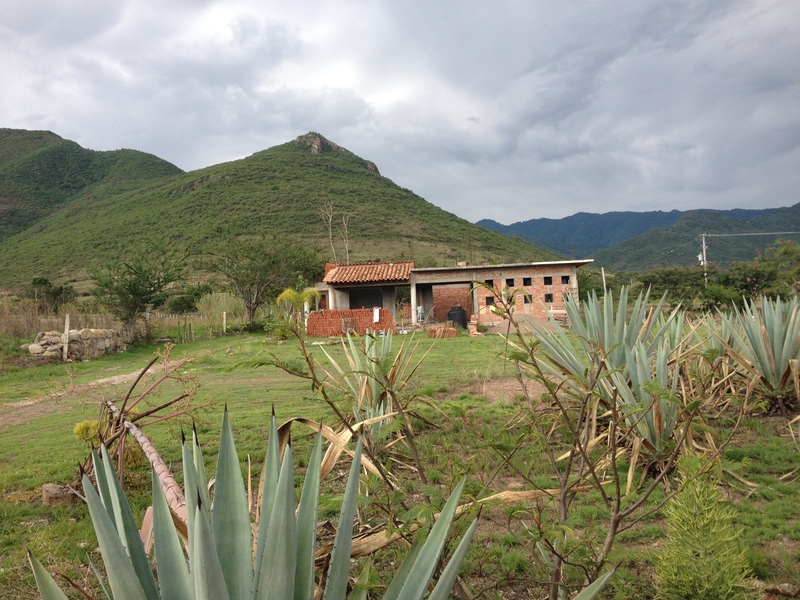 She and the boys were ready to go when we arrived, with hostess gifts for all three of us: agave plants (which they use to make mezcal just down the road) in milk cartons that middle son Daniel had transplanted from their garden. Lupita never, ever complains about the hand she’s been dealt: widowed before she was 40 from an abusive, alcoholic husband and left with three teenaged boys to raise on a weaver’s meager and occasional income. 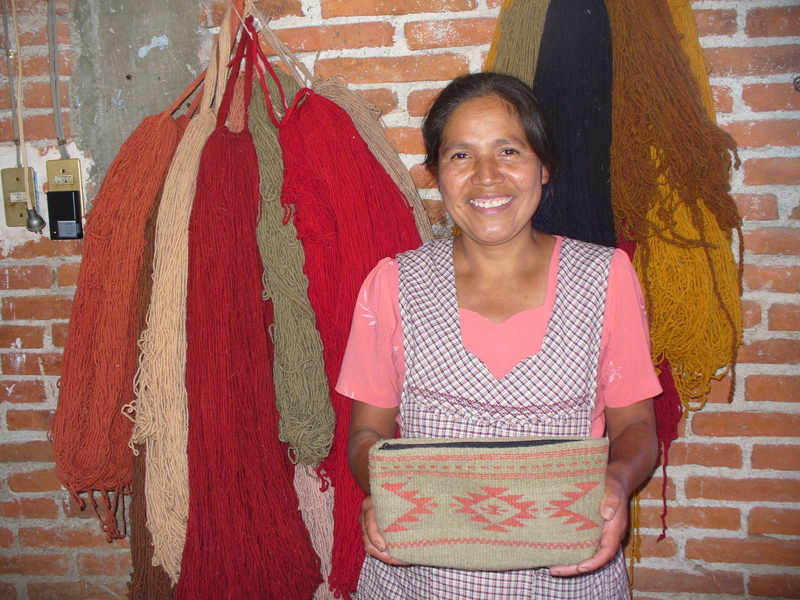 Just when she was getting a little ahead and had been awarded training and an industrial sewing machine from a government grant to translate her weaving skills into computer bags, she found a lump in her breast. She had a mastectomy last fall and though the prognosis was fairly good at stage 2, doctors told her she probably wouldn’t be able to weave again because of the heavy repetitive arm motion. 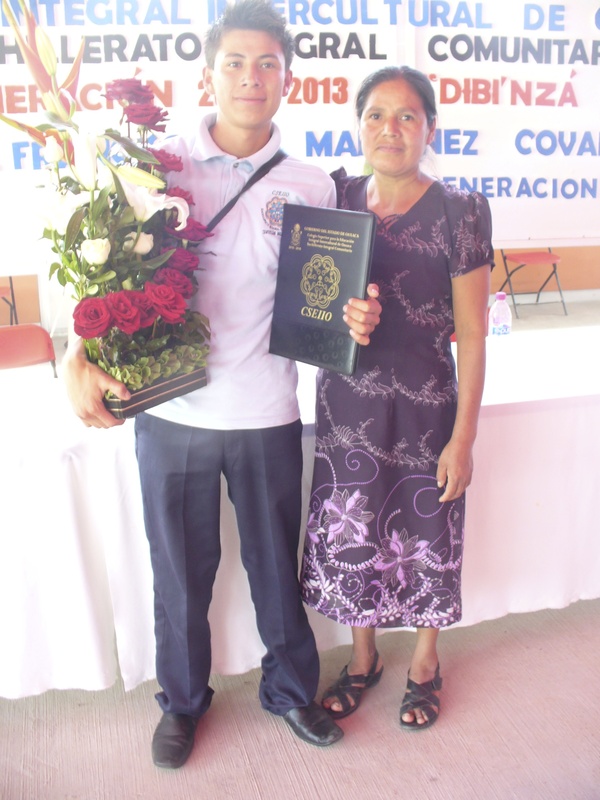 Hugo with mom Lupita at his high school graduation in 2013. I was his “sponsor,” which meant I provided flowers and walked across the stage with him. 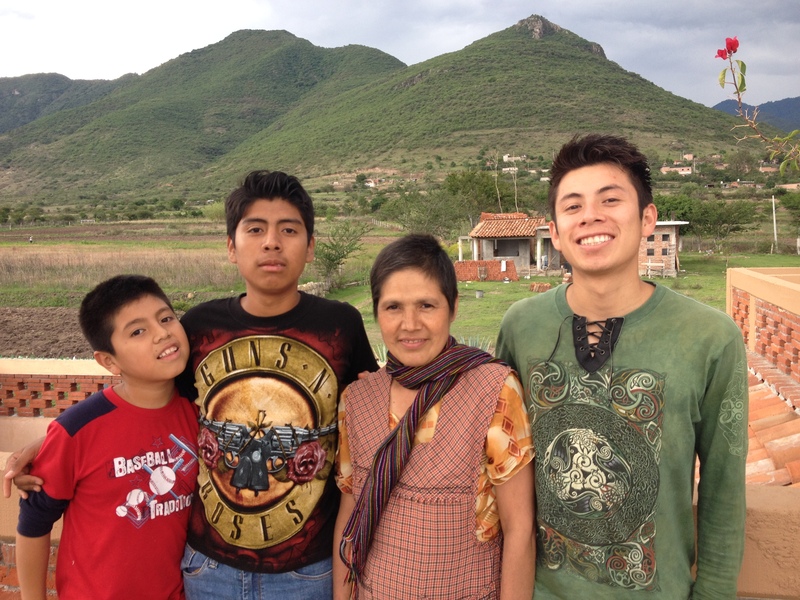 Oldest son Hugo, 20, works in a butcher shop in town doing paperwork and generating receipts; sons Daniel, 17, and Cristobal, 11, are still in school. 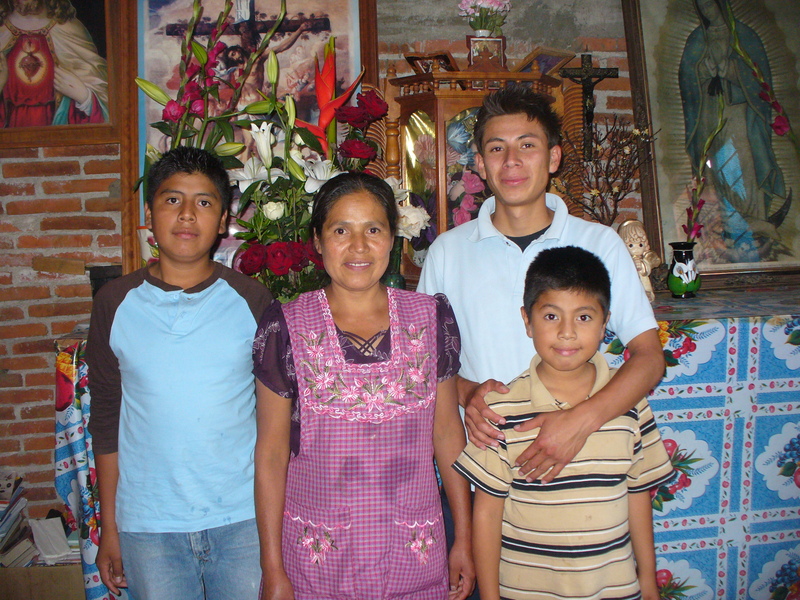 Norma, besides living in the same town, had been instrumental in collecting funds from the community, by which Lupita was able to have immediate surgery by a private and well-respected woman surgeon instead of waiting months for surgery in a public hospital, since there was no money and no insurance to pay for it. 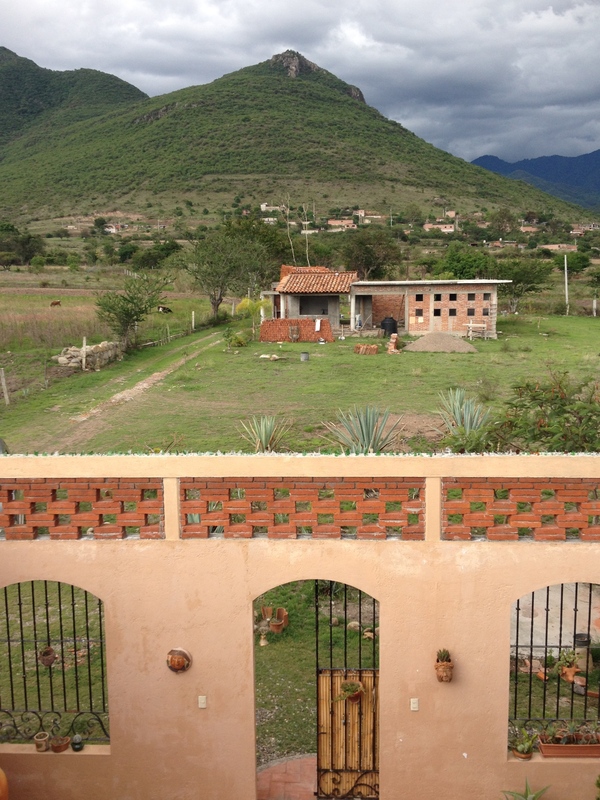 Hugo had graduated high school – an enormous achievement here – a couple of years ago and had even started classes at the University of Oaxaca, but even the modest costs of paying the $25 entrance exam and monthly fees of about $80 have sidelined his college aspirations for a while. He wants to be a teacher, he says. Lupita herself is thinking about opening a little café in her home to showcase the kind of healthy food she’s learned to love in her recovery process. If she can’t weave, which is the only work she’s ever known —her strength being the exquisite colors she coaxes into hand-spun wool yarn from plants and nuts. She once discovered a beautifully muted dusky lavender color unseen anywhere else by combining red cochanil insect dye with blue indigo root, the result a surprise when boiled in a rusty iron pot. But back to pizza. We arrived at Norma’s, out in the beautiful, silent countryside with mountains on a 360-degree turn, to a set table worthy of a house and garden magazine. The boys were fascinated by a book in English: “101 Beautiful Small Towns in Mexico,” while Lupita picked up a coffee table book on rebozos, woven shawls. By our standards, it was a simple lunch: frozen pizza baked with a little extra cheese, green salad, and zucchini bread with fruit for dessert. By their standards, it was an incredible luxury to have all the food the boys could eat (Hugo sat next to me and managed at least a dozen pieces; Cristobal wasn’t far behind), prepared for them and cleaned up after them, no less. Lupita laughed when I said her new gamine haircut would cost big bucks in the states (she’s been growing it back since her head was totally shaved in the fall for chemo) and said she would stop when it reached her shoulders, not her waist as before since it took too long to dry. She’s 43 now anyway; time for a change, she says. 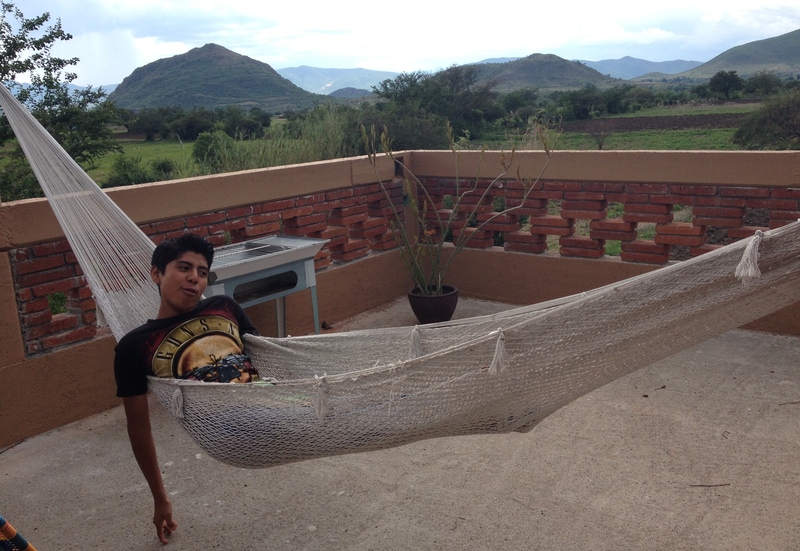 After lunch, we took in the view from the rooftop terrace; Daniel read a book in the hammock and I had to admonish Cristobal to get off the wall overhanging the tile roof. Hugo took a cell phone call from his girlfriend, who’s only 15 to his 20 years. After confirming her driving schedule for starting radiation treatments in a couple of weeks (God bless you, Mary), we dropped Lupita and the boys home back across town and up the hill, making several detours around the street work done by local crews in Teotitlán’s usos y costumbres system of providing municipal services by volunteer duty rather than federal taxes. Rather than drop me off to take a bus or taxi home, Mary offered to drive me back into the city, though we detoured back to her house in Huayapam to pick up her dog and take him for an afternoon ride. She dropped me off right at my gate, and it started to rain only after I was already inside. That was about 6:30, so it was more or less a 5-hour lunch date, transportation and all. Nothing’s exactly easy here. But I wouldn’t have it any other way. It so makes you appreciate the ordinary.